Every time I enter an airport, I sneak peek a look at the fiction section of whatever book store there might be in the terminal. These days, I don’t have much time for reading, so I typically leave empty-handed, having gotten a little word fix simply by touching the jackets with my fingertips, flipping through the pages, reading the titles. It’s a little like how I imagine plants sucking in sunlight; they don’t need to actually touch the sun to absorb enough rays to grow a bit. 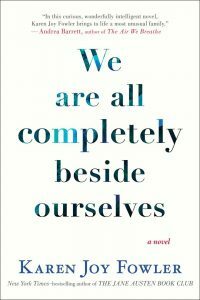 It’s this habit, coupled with a longer than usual flight delay, that partnered up to put “We Are All Completely Beside Ourselves” into my hands just long enough that I decided to buy it rather than read it via osmosis. It’s also this particular string of events that didn’t allow me enough time to read the back cover synopsis. And boy am I glad I didn’t. But we will get to that in due time…for now, let’s dive in. We are privy to quick glimpses of our protagonist, Rosemary Cooke, a girl who once talked way too much, finding purpose in mastering enormous words as a child to impress her psychology professor father, while simultaneously differentiating herself from her less-verbal twin sister, Fern. As we meet Rosemary, she is a college student at UC Davis, painfully lonely (and desperate to appear as unbroken as we suspect she must be) while befriending a hurricane of a girl named Harlow, thus pointing us to the start of their story. Only, this is a novel of one hundred beginnings and getting repositioned at the outset of each makes for a wily ride filled with surprises and layers unfolding like strands of hair being pulled from an elaborate braid. Fast forward, fall back. Rosemary is 5-years old again, fuming over having been sent to live with her gaudy, inattentive grandparents unexpectedly. Precocious and afraid, she runs away, determined to go home. Her wish is granted and she is returned to the arms of her parents, only, her world has dramatically changed. There is a new house. Her mother has fallen into the dark embrace of depression. Her father has started to drink. Lowell is desperately angry. Fern is missing. This is the part of the review where I don’t grant you the same surprise that I was lucky enough to receive. I know…unfair, right? But in order to talk about the book, I have to let out the secret I missed by not reading that book jacket at the airport: Fern is a chimpanzee. After being brought into the Cooke home as part of a 1970’s Skinnerian experiment, Fern and Rosemary were raised as identically as possible, cultivating all of the love, resentment, friendship and jealousy between them as any other sibling duo. As Fowler reminds us, “In the phrase ‘ human being,’ the word ‘being’ is much more important than the word ‘human.” This becomes clear as we watch Rosemary’s awkward struggle to assimilate with her human classmates in kindergarten–simultaneously coping with the sudden and inexplicable loss of her sister–by calcifying her emotions and shrouding herself in silence. The novel highlights Rosemary’s accidental quest for truth, despite her instinct to avoid it altogether. It is a study of the muddy microcosm of family life and an undeniably soul-wrenching exploration of animal rights. Do we fear the blaring similarities we share with them? Where is the line? Does it even exist? 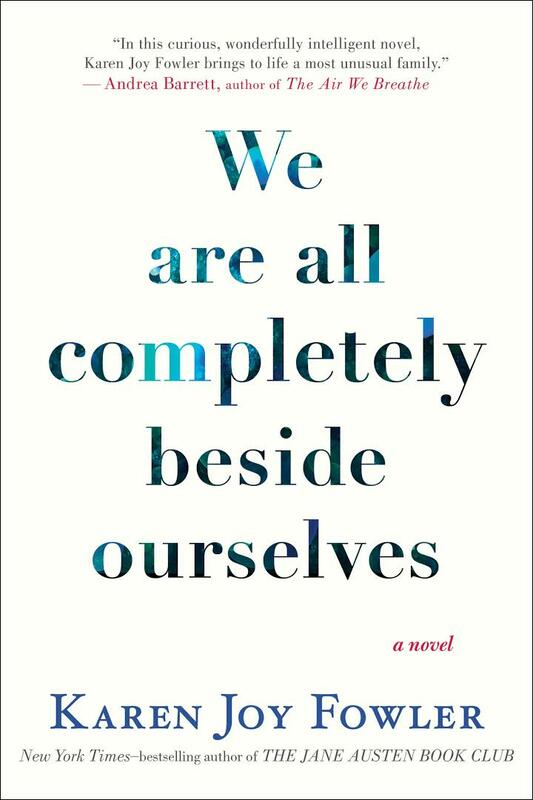 “We Are All Completely Beside Ourselves” is brilliant and heartbreaking. It’s painful truth draped in quick wit, so effortlessly crafted that it will bore its way into you far deeper than you’d like it to. It is an important book, but, mark my words, it will hurt.